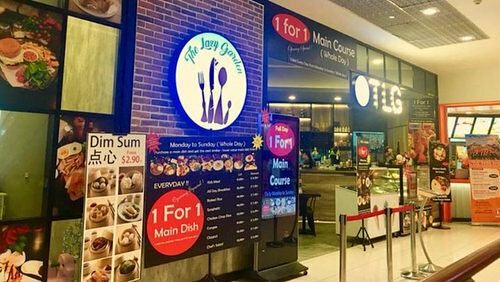 Asian Western fusion restaurant The Lazy Garden Cafe operates within Singapore’s City Square Mall, at 180 Kitchener Road. Offering a menu created out of modern Asian Western fusion cuisine with an emphasis on Italian flavours, The Lazy Garden Cafe has a great variety of comfortable food to tantalize your tastebuds. …Japanese curry rice dishes, all day breakfast items, salmon salads, dim sum meals, cream asparagus, waffle desserts, ice cream desserts, delicious coffee, milk teas, toast & french toast starters, smoothies, coolers & sodas, pudding desserts,, soups, kids meals, and much more. The official Facebook brand page for The Lazy Garden Cafe restaurant is available at www.facebook.com/thelazygardencafe. Following the Facebook page, you’ll learn more about the restaurant’s menu items and changes to the menu, promotional offers, events, and more.